Glorious distressed florals and cool grungy inked appeal make this Inked Goddess shirt a must own for tat fans. Tattoo devotes take note: This is one t-shirt design that you shouldn't pass up. Gorgeous swirling florals and cool ink splatters give our Inked Goddess shirt an appeal that can't be denied. Our Inked Goddess shirts look amazing on either light or dark materials and have such a hard rocking look that it's going to get tons of appreciation from friends. Order your Inked Goddess shirt or get one for the inked goddess you love, we have over a hundred awesome name brand shirts and colors you can choose from. Our Inked Goddess shirt is perfect for just about any activity and with it's understated rock 'n roll appeal it has a lot of class while staying rebellious. We have several new tattoo t-shirt designs we are working on now so be sure to check back often to find our latest additions. For people that love the ink, our Inked Goddess t-shirts are just the thing for tattoo artists or anyone that can't get enough ink. 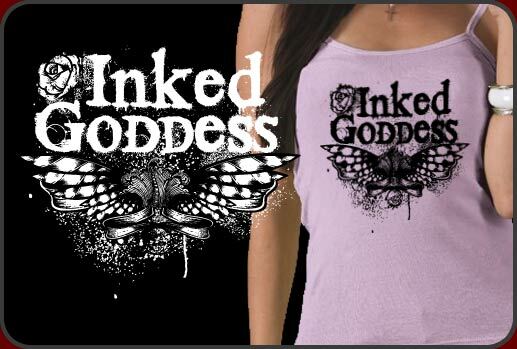 Beautiful Inked Goddess t-shirt, tattoo t shirt, Inked Goddess tee shirts and we have gorgeous Inked Goddess garments in many different shirt styles including Inked Goddess tank tops, ringer tees and lots more. It's a great way to class up and show off your tats too.